I have always dreamt of going to Japan. It seemed to me that it’s a country like no other, entirely different and mysterious. I started to become more and more obsessed about Japan. It got to a point when I would spend hours reading guide books and eating sushi at least once a week. 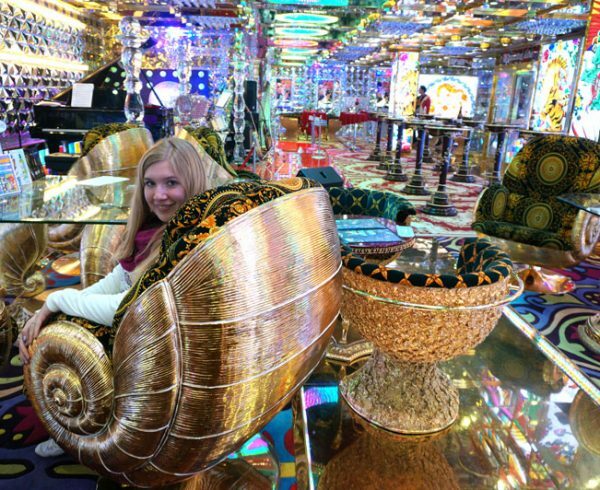 I couldn’t wait any longer; I decided I just had to go to Tokyo to fully experience all its beauty and fun. If you ever wondered when is the best time to visit Japan, make no mistake! May this picture be the perfect explanation why Japan is the most stunning place on Earth in the spring time – Cherry Blossom!!! In this guide, you will learn everything you need to know to plan a trip to see cherry blossom in Japan. 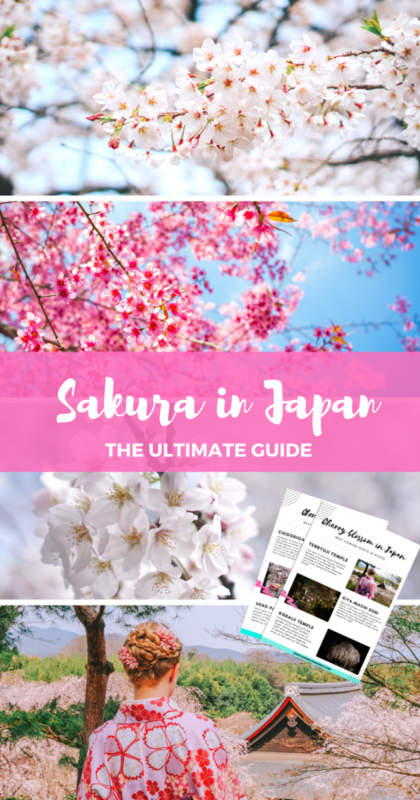 I have also designed for you a special list with best Sakura (Japanese for Cherry trees) viewing spots in Tokyo and Kyoto. You can print it and check it on the go! 2 When is Sakura Festival? 3 Where to see cherry blossoms? 4 How to plan for your Sakura experience? 5 Sakura + food = yum! Hanami which in Japanese means exactly “cherry-blossom viewing” is a tradition that is centuries long. It is an annual celebration of welcoming spring and of appreciating the temporal beauty of nature and transience of life. The tradition of seeing flower blossoms has first originated with plum viewing (ume matsuri), later though cherry trees have completely taken over this tradition. Ume blooming still plays an important part in Japanese culture as it is the very first sign that winter is ending, and the early spring is coming. It is also the time for the first picnic of the year before hanami. 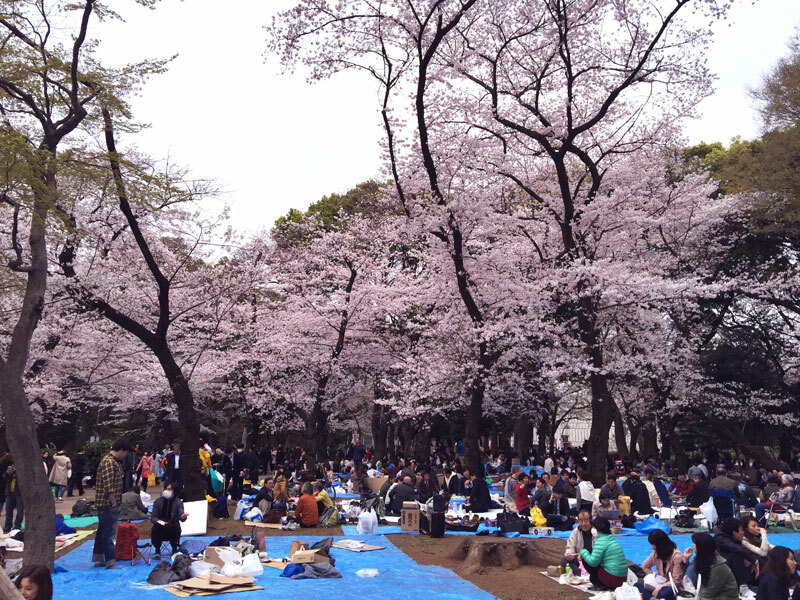 Coming back to hanami, every year people gather together with their friends, family or colleagues under cherry trees to enjoy food and drinks and to have fun. The celebration starts during the day but often is prolong until night, as parks in the major cities lighten up the trees after dark. 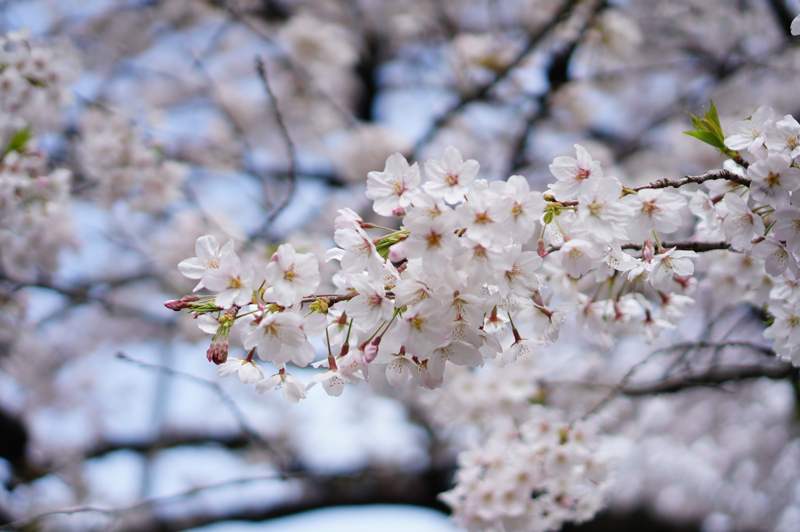 One of the most common myths about cherry blossom in Japan is that it begins the end of March/beginning of April and it only lasts for two weeks. That is simply not true! 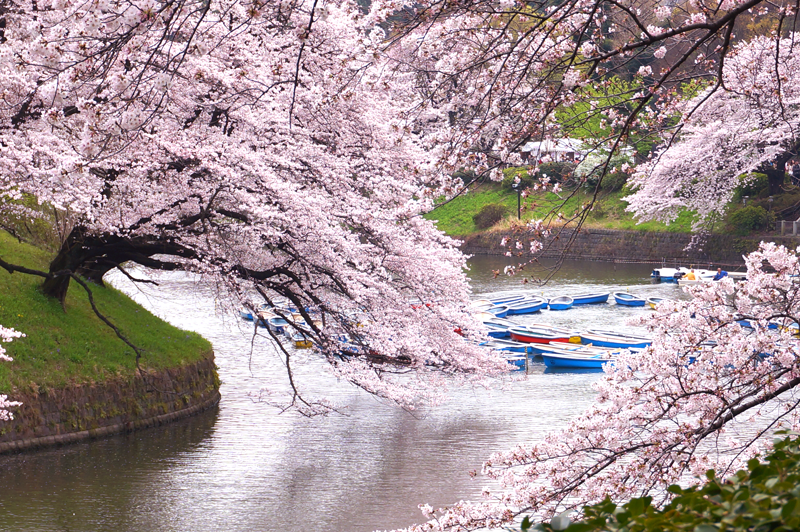 Japan is a big country, and there are cherry trees everywhere, from north to south shore! And they all bloom at a different time, as it depends on latitude, climate, surrounding, elevation and the variety of trees. 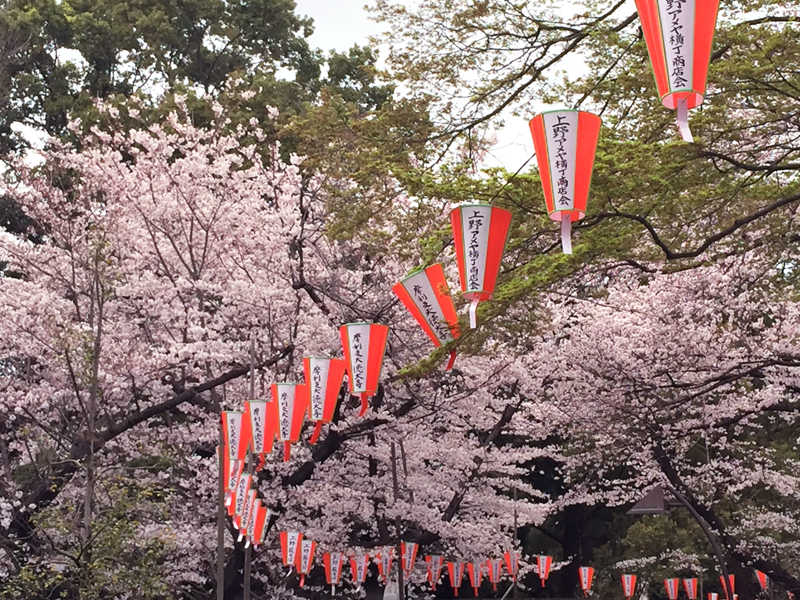 So, even if you are late for Sakura in Tokyo or Kyoto, you can still catch it in the different parts of the country. The best source of information is this website https://www.jnto.go.jp/sakura/eng/index.php where you can find a very precise sakura calendar. Where to see cherry blossoms? If you have studied the Sakura calendar from the link above, you will know that you need to choose your location depending on your timing. Obviously, it is very hard to do, as you need to book your hotels way in advance before the calendar is even available. 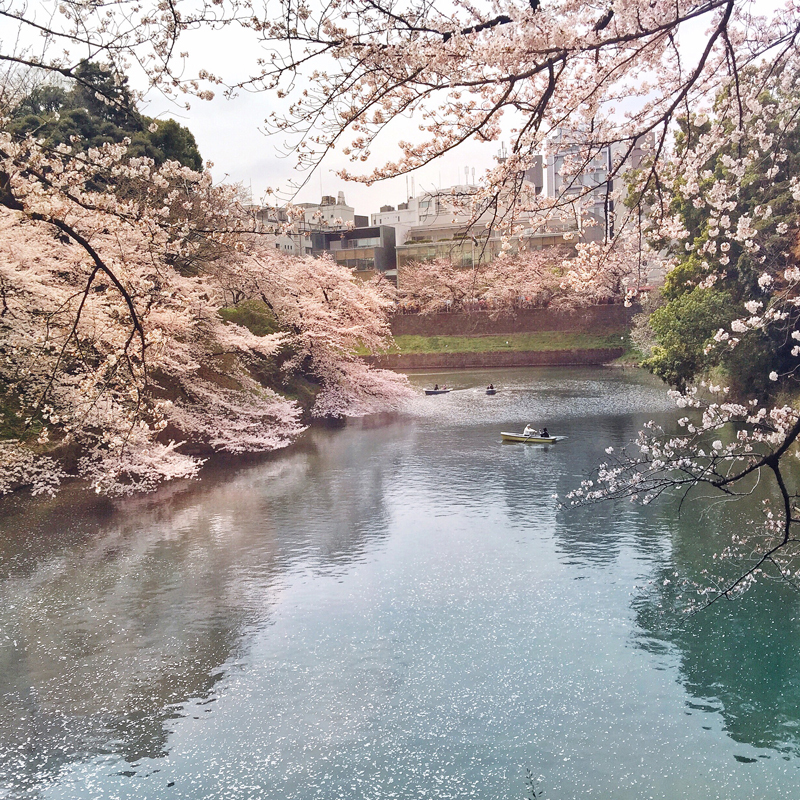 The main rule is that in Tokyo and other north locations the trees bloom earlier than in the south of Japan. For the first timers, I highly suggest this order: Tokyo, Five Lakes and then Kyoto. It is amazing how many cherry trees you can find in the cities parks and how beautifully they look in combination with urban architecture. When I arrived at Tokyo Narita Airport, I was literally blinded by sakura flowers. They were everywhere – on the posters, magazine covers, store displays. Right away I felt I’m in cherry blossom paradise ;). It was about 10 in the morning when I found myself at the bustling Tokio Station. I couldn’t check in yet at my apartment, so I left my bags in the locker and went straight to Chidorigafuchi. At first, it was not as easy as I thought. I was jet lagged after 13-hour fight, my knowledge of Japanese was close to zero (I know how to say ‘thank you’ and ‘hello’! ), and I had no google maps..
That’s why I have created for you two checklists with best sakura spots to visit in Tokyo and Kyoto. You can print it and stop being dependant on streets signs (in Japanese ;)). You can download it by simply, clicking the image below. How to plan for your Sakura experience? 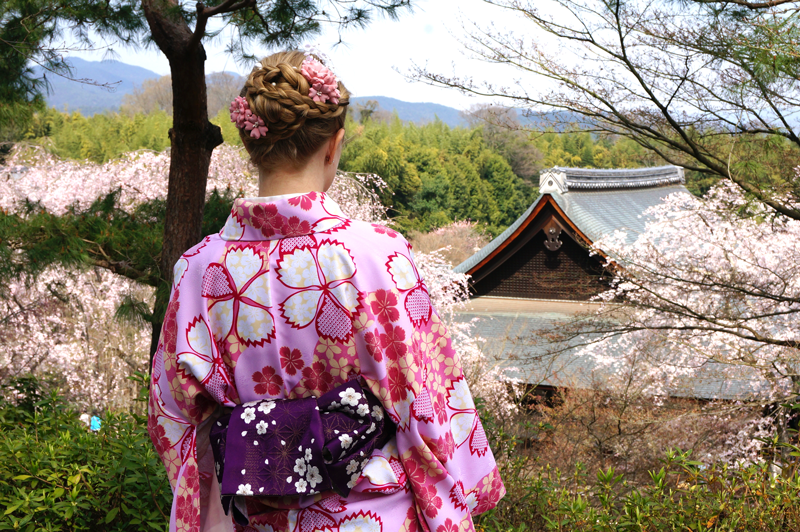 Cherry blossom in Japan is extremely popular not only among international travellers but also Japanese tourists! It is important to plan ahead if you want to have a wider choice of the places to stay but don’t have hopes for better prices. It is expensive! 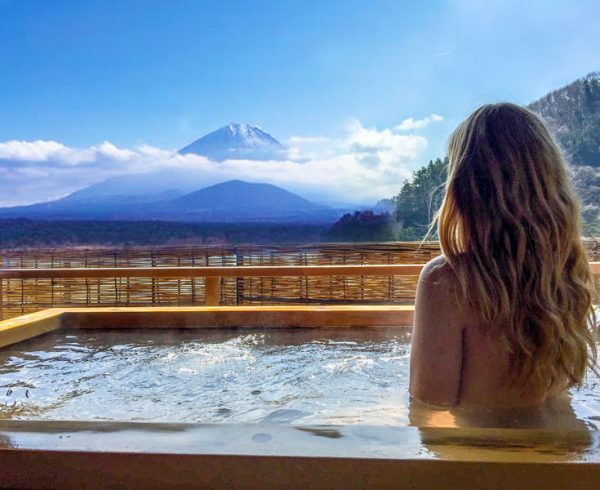 And you need to book well in advance not only to get a decent hotel or ryokan (traditional Japanese inn) but to get a bus ticket to a smaller city, like Fuji Five Lakes. Pro tip: If all the tickets are sold out to Lake Kawaguchiko from Shinjuku, take the bus from Shibuya. It is much less crowded, and you can jump on even the same day! Sakura + food = yum! After about 2 hours when my camera run out of battery and I got a bit hungry I went around the neighbourhood to check out some stores and restaurant. 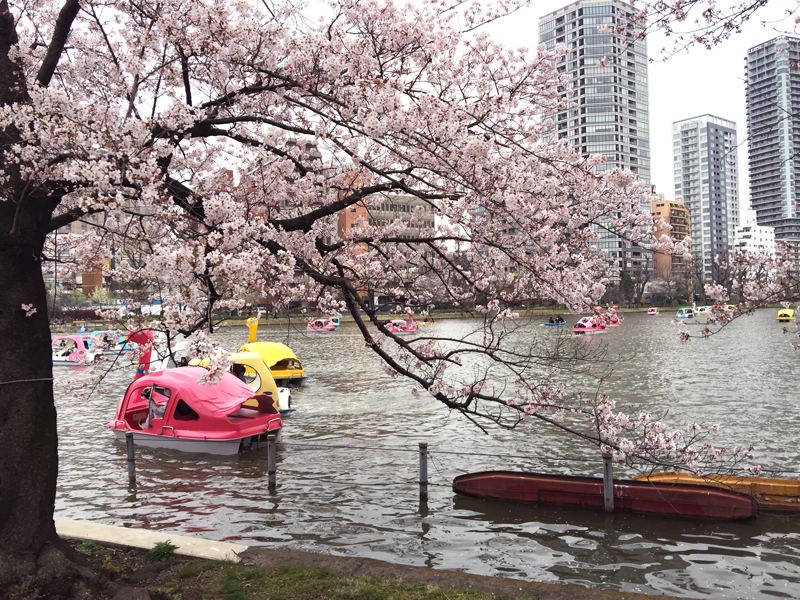 And I completely adored how all the locals were crazy about Sakura. 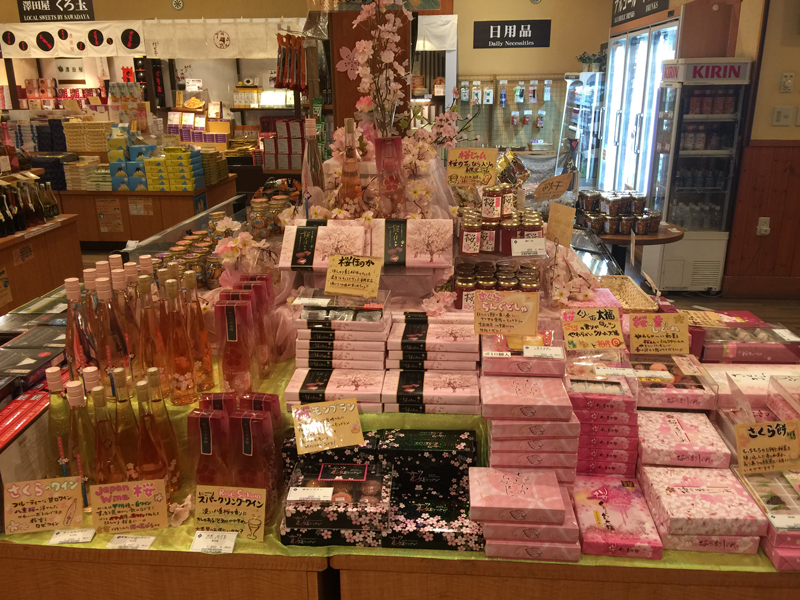 I totally recommend trying sakura wine and Sakura kit kat! Basically, eat as much as you can in Japan! 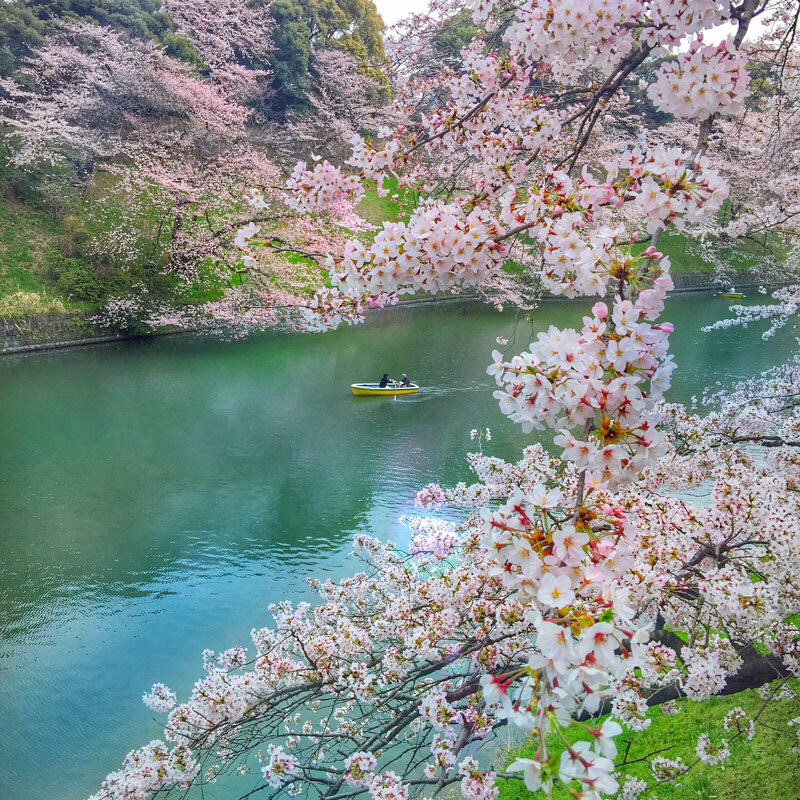 Don’t forget to download the map with best places to see cherry blossom in Tokyo and Kyoto! 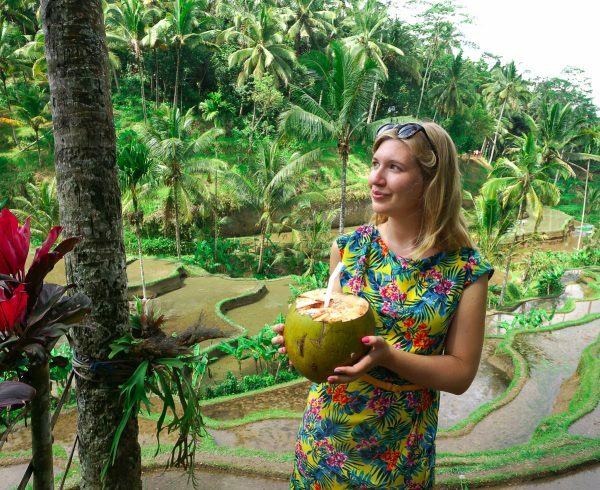 Best places to visit in Bali + my favorite restaurants!